Taylored Expressions Die Focus: Pockets and Pages 3x4 Photo Frame! Hello! 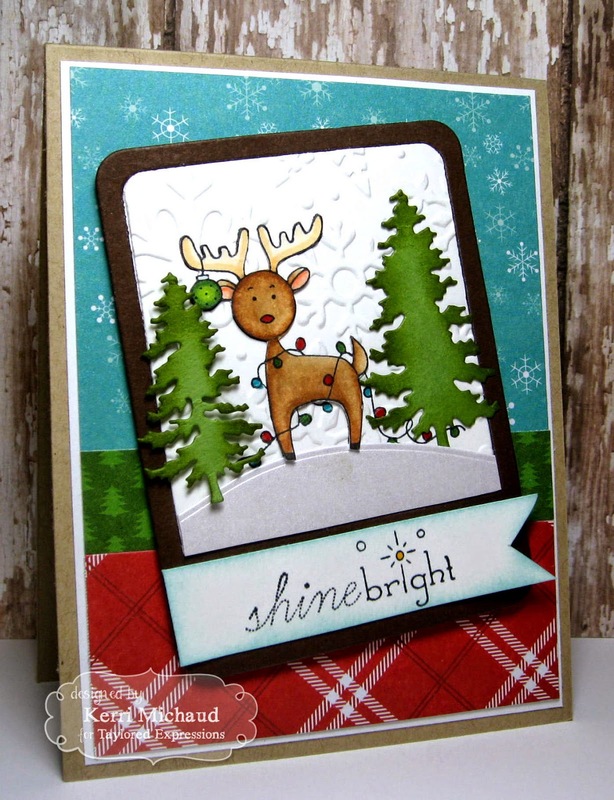 I have a fun little Christmas card to share with you today using some fab Taylored Expressions stamps and dies! I started out by cutting my frame using the TE Pockets and Pages 3x4 Photo Frame Die. I cut it out of Chocolate Truffle cs and then cut the inside out of Sugar Cube cs. I stamped this darling deer from the TE set Deck the Halls twice. Once on the inside of my frame, and then on a separate sheet of paper so I could color it and then cut it out. After stamping my image, I embossed the white panel with the Winter Flurry Embossing Folder. I then adhered my colored deer as well as a hill that I cut using a TE Build a Scene Rolling Hills Die, and the trees that I cut using the TE Evergreens Dies. Finally, I added the sentiment from the Deck the Halls set. The dp I used is American Crafts Holiday. Thanks for stopping by today and taking a peek! I hope you are having a wonderful Thanksgiving break so far! I am loving having my family home and having a break from school is nice for me too! Enjoy your day!